We have commissioned independent research to analyse how important the East Coast Main Line is to UK PLC. Download the 2016 research from independent consultants JMP into the benefits of upgrading the East Coast Main Line. Download a summary of the findings of the 2016 research from independent consultants JMP into the benefits of upgrading the East Coast Main Line. You can download your own copy of the Prospectus for Investment in the East Coast Main Line by clicking the link. The local and regional economies served by the East Coast Main Line corridor rail services are of great value to the UK. Including London they represent just short of a half of UK economic output. Even when London’s large economy is excluded from this calculation the other local and regional economies along the route contribute over £300 billion p.a. GVA. The diversity of economic geographies means that the range and variety of connections between the areas within the East Coast corridor is complex. However, this work has shown that investment in the East Coast Main Line corridor and its rail services stands to bring benefits to all of the local and regional economies along the length of the corridor. The research and analysis presented in the report demonstrates that investment in the line would yield significant GDP benefits to the UK as a whole and bring specific benefits to all of the local and regional economies along the length of the line. Investment in the East Coast Main Line is vital to help unlock this economic potential and growth. There has been under investment in spite of the demonstrable importance of the economies served in the East Coast corridor to the UK economy. This is not a choice between investing in the East Coast Main Line or in HS2. They are complementary investments and indeed these ECML investments are essential if HS2 is to deliver to its full potential. Investment to realise up to eight long distance high speed (LDHS) train paths out of London, and nine north of Peterborough, would generate over £0.3bn of additional GDP per year. If developed in combination with the High Speed 2 (HS2) Phase 2 proposals this could rise to over £0.5bn per year. This would be worth in the range £5bn-£9bn to the UK economy in present value terms over 60 years. 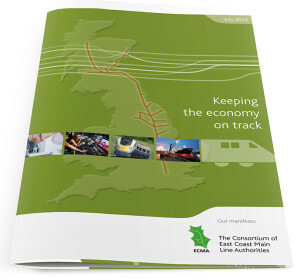 Our research was conducted by specialist consultants, JMP Consultants Limited and Albion Economics to evaluate the potential for economic growth from an improved ECML. The methodology used in the research is consistent with that used by the Department for Transport and Network Rail. ECMA has written to Sir Peter Hendy and we’ve responded to Nicola Shaw’s interim report, we will respond to her full report next year. Separately, Dame Colette Bowe’s Review set out that the case for investment in the ECML needs to be made without further delay. The findings of the Hendy and Bowe reviews have now been published, lifting some of the uncertainty hanging over the rail industry since they were announced.